By Jon Queally, staff writer for Common Dreams. Published 9-2-2015. Citing a series of vicious military attacks in recent years coupled with severe shortages of water, medical supplies, and shelter created by an internationally-backed blockade, a new report issued by the United Nations warns that if current trends continue the Gaza Strip will be virtually “uninhabitable” within five years. Home to approximately 1.8 million people, Gaza is often referred to the largest open-air prison in the world and the latest report, published by the UN Conference on Trade and Development (UNCTAD), is just the latest official assessment (pdf) to paint a devastating picture of life inside the sealed borders of Gaza which has now faced eight years of economic blockade and three large-scale military operations by Israel since 2009. According to UNCTAD, military aggression and the ongoing blockade have accelerated the “de-development” of the Occupied Palestinian Territory, a process by which development is not merely hindered but reversed. 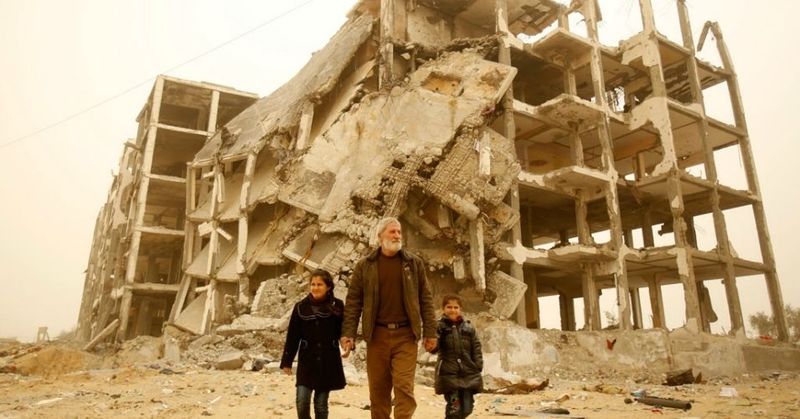 The combined factors of war and economic suffocation, the report says, has shattered Gaza’s ability to export and produce for the domestic market, ravaged its already debilitated infrastructure, left no time for reconstruction and recovery, and accelerated the sharp decline in overall well-being of all who live there. In addition to the 500,000 people who have been displaced in Gaza as a result of the most recent military operation, the report estimates significant economic losses, including the destruction or severe damage of more than 20,000 Palestinian homes, 148 schools and 15 hospitals and 45 primary health-care centres. As many as 247 factories and 300 commercial centres were fully or partially destroyed. Serious damage was inflicted on Gaza’s sole power plant. The agricultural sector alone suffered $550 million in losses. It is estimated that, even before the military operations in July and August 2014, Gaza’s electricity supply capacity was not enough to meet 40 per cent of the demand (2012 figures). The electricity and energy crisis is exacerbated by the fact that the Palestinian National Authority is not permitted to develop and use the offshore natural gas fields discovered since the 1990s on Gaza’s Mediterranean coast. In 2014, unemployment in Gaza reached 44 per cent, the highest level on record. Joblessness was particularly severe among young women Palestinian refugees in Gaza, with more than eight out of 10 women out of work. The economic well-being of Palestinians living in Gaza is worse today than two decades ago. Per capita gross domestic product has shrunk by 30 per cent since 1994. Food insecurity affects 72 per cent of households, and the number of Palestinian refugees solely reliant on food distribution from United Nations agencies had increased from 72,000 in 2000 to 868,000 by May 2015, representing half the population of Gaza. The report maintains that even before the three military operations, the economic blockade in place since 2007 had already led to the large-scale cessation of productive operations and loss of employment. Exports from Gaza have been almost completely blocked, imports and transfers of cash severely restricted and the flow of all but the most basic humanitarian goods suspended. Well aware of the scale of the destruction and the plight of the Palestinian people living under occupation in the Gaza Strip, over 150,000 individuals and dozens of humanitarian organizations last week told world leaders that the international community is long overdue in forcing Israeli government to lift their blockade on Gaza and allow its residents the right to rebuild their lives. This entry was posted in Civil Rights, Economics, Education, Energy, Government, Health Care, Homeless, Human Rights, Income Inequality, International Agreements, Media Issues, Military, National Security vs Police State, Religion, Social Justice, Solidarity, Terrorism, War Crimes, Women's Issues, Workers' Issues and tagged Atrocities, Civil Rights, Economics, Education, Energy, Gaza, Gaza Strip, Gaza War, Health Care, Homelessness, Human rights, Income Inequality, International Agreements, Israel, Security, social justice, Solidarity, terrorism, War Crimes, Women's Issues, Worker's Rights, workers' issues on September 3, 2015 by ew.